Preheat the oven to 350 degrees F. Line 2 muffin tins with paper liners, and set them aside. In a large bowl, mix together the chocolate cake mix, eggs, vegetable oil and water. Fill each liner about 3/4 the way full with batter, and bake for about 18 minutes or until a toothpick inserted in the centers comes out clean. Remove the cupcakes from the pan, and place them on a wire cooling rack. Let them cool completely. Once cooled, frost each cupcake with chocolate frosting. 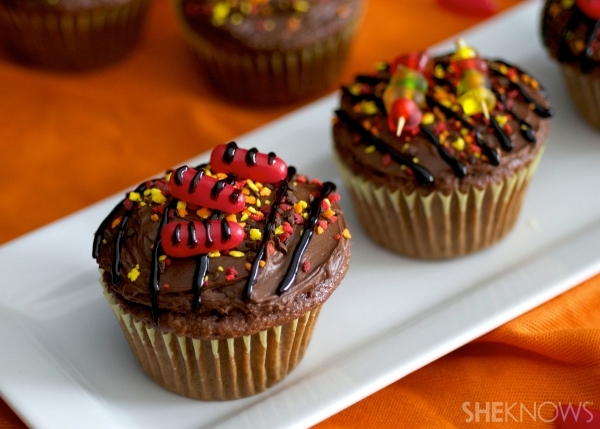 Sprinkle the chopped-up multicolored sprinkles on top of the chocolate frosting of each cupcake. Using the black icing gel, make vertical lines on top of the sprinkles (for the grill). To make the hot dogs, use the black icing gel to make “grill mark” stripes on the hot tamales. Carefully place them on top of the “grill” lines on the cupcakes. For the hamburgers, form small patties out of the red fondant, and make the small “grill” lines using the black icing gel. Add a few mint leaves to the top for lettuce if you want. To make the skewers, chop the gummy worms into small pieces. Carefully skewer them in alternating colors. I fit about 5 pieces on each skewer. Place on top of the grill, and enjoy!